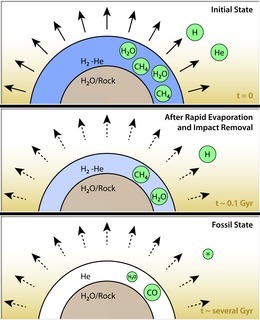 This diagram illustrates how hypothetical helium atmospheres might form. These would be on planets about the mass of Neptune, or smaller, which orbit tightly to their stars, whipping around in just days. They are thought to have cores of water or rock, surrounded by thick atmospheres of gas. Radiation from their nearby stars would boil off hydrogen and helium, but because hydrogen is lighter, more hydrogen would escape. 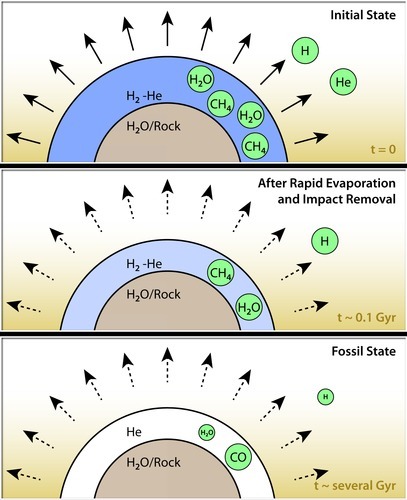 It's also possible that planetary bodies, such as asteroids, could impact the planet, sending hydrogen out into space. 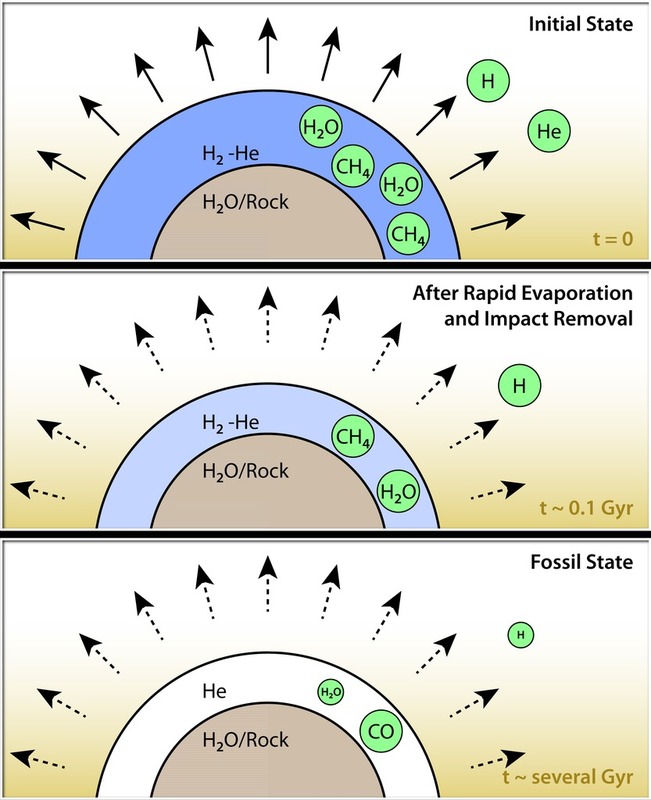 Over time, the atmospheres would become enriched in helium. With less hydrogen in the planets' atmospheres, the concentration of methane and water would go down. Both water and methane consist in part of hydrogen. Eventually, billions of years later (a "Gyr" equals one billion years), the abundances of the water and methane would be greatly reduced. Since hydrogen would not be abundant, the carbon would be forced to pair with oxygen, forming carbon monoxide. NASA's Spitzer Space Telescope observed a proposed helium planet, GJ 436b, with these traits: it lacks methane, and appears to contain carbon monoxide. Future observations are needed to detect helium itself in the atmospheres of these planets, and confirm this theory.